I cannot help making some comments on the great article France’s baby boom secret: get women into work and ditch rigid family norms that has appeared recently in The Guardian. As I have a privilege of being familiar with at least three labour market systems (the “ex-soviet”, German and French), I will make an attempt to take a critical look at all three and try to combine some of their best features into a “perfect solution” for working women. One of the main messages of the article is that “fertility in Europe is higher in countries where women go out to work, lower in those where they generally stay at home”. Now, I do not see the article as a manual for increasing fertility rates in Europe or elsewhere because my strong belief is that population growth is the last thing our planets needs today, taking into consideration all the environmental threats caused by human economic activity such as climate change, overfishing, soil depletion etc. Some researchers even state that the digital revolution actually facilitates job loss because “inefficient” humans are are replaced by machines, computers and software (citations on this subject will come later because it is a big and exciting topic in its own right), while new jobs are not created in a sufficient amount. So the message is that before we try to increase birth rates, countries should figure out what to do with all the unemployed citizens (e.g. 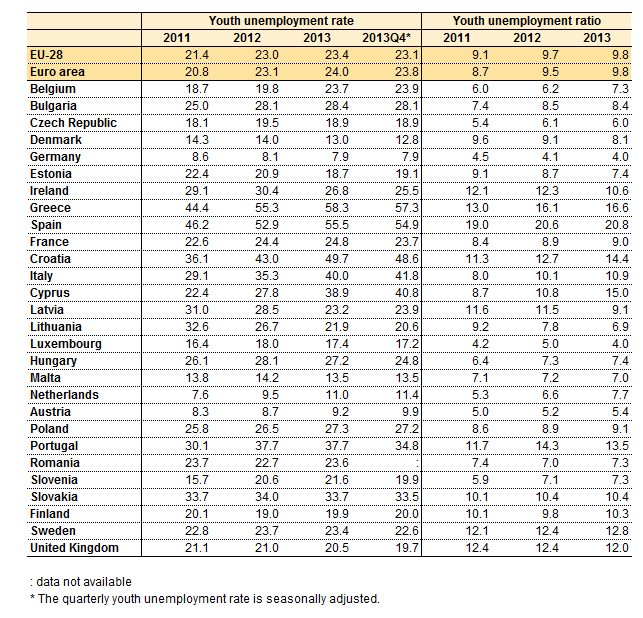 10.4 per cent in France in Q4 2014 according to Insee, 23.7 per cent in Spain in January 2015 according to Trading Economics) and youth unemployment rates are even more alarming in many EU countries (see Figure 1). This information supports my earlier reflections on the conditions for working mothers in Germany. However, I absolutely do not want to say that conditions in France are perfect – far from that. For example, while parents in Germany have the right for a total of 14 months of a financed maternity-paternity leave, in France it is only 3 months! So the majority of French babies are 100% formula-fed from that age. Well, it might be good for the economy (and especially for the formula producing industry), but is it good for the children? Not so sure. For example, the WHO recommends exclusive breastfeeding up to 6 months of age, with continued breastfeeding along with appropriate complementary foods up to two years of age or beyond. While it is clear that formula can never be as good as breastmilk, regular tests (for example by the German Oekotest) suggest that it can be even harmful due to the presence of toxic substances. That is why it was clear for me from the very beginning that my children would not take any formula and I was very happy they were not born in France for this reason. On the other hand, I am absolutely not a kind of mother who leaves her child at home until the age of three like many Germans and Belarusians do. As soon as my children passed this very sensitive first year when they are very much dependent on the mother for food and care, I was glad to start working and doing research again, while they learned German at their nanny’s. In my opinion this is the perfect approach for both children and parents (the golden middle) – more possibilities for childcare (e.g. breastfeeding) in the first year, and more possibilities to work after that. France has managed to organise the second part but neglects the biological role of a mother when it comes to breastfeeding and caring for a baby. Germany, on the contrary, does well in the first part, but does not offer a sufficient childcare system after the first year. So if we could remember that a woman can be both a mother and a valuable employee, and combine the two systems, that would be perfect! Caution, I do not mean that all French mothers will have to stay at home the first year (I returned to part-time work when my daughter was 4 months old) if the do not want to. But having a choice between working and caring for the child in the first year would be great. Even better would be employers that offer to mothers possibilities to make pauses for breastfeeding at work! Yes, we have been trying to forget that biology matters for a long time and look at what we have done to our planet and to ourselves (depressions, burnouts, suicides, sleep deprivation, employees without any motivation – the numbers are increasing). The conclusion (as confirmed by the article) is that women (and men) generally need both – family with children AND a meaningful career. In many countries, poor conditions are still forcing them to make a choice between these two options, which is not good for the economy, for the society and for every individual. This entry was posted in Uncategorized and tagged breastfeeding, career, childcare, children, family, France, gender equality, gender pay gap, Germany, women, work.